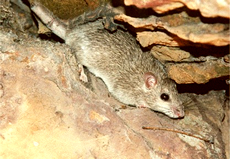 The central rock rat is one of five species of rock rats found in the southern portion of Australia's northern territory. It was believed to be extinct until rediscovered in 1996. These rodents grow to be stocky with thick, yellowish-brown fur on the upper body and lighter fur on the lower body. Weight ranges from 70 to 120 grams, and head and body length ranges from 4.2 to 5.9 inches. Rock rats are also called thick-tailed rats because of their unusually thick, long tails. They are known to lose their tails, fur and skin very easily if not handled carefully. The central rock is the only rock rat species that lives in the arid habitat of central Australia, and it has been found in a variety of vegetative communities from tussock and hummock grasslands to low open woodlands. Very little is known about its behavior and ecology. Rock rats are believed to be nocturnal. Diet consists of seeds of grasses, shrubs, forbs, and insects. Juveniles have been seen in the wild in June, and some have been bred in captivity with litter sizes of up to four young. 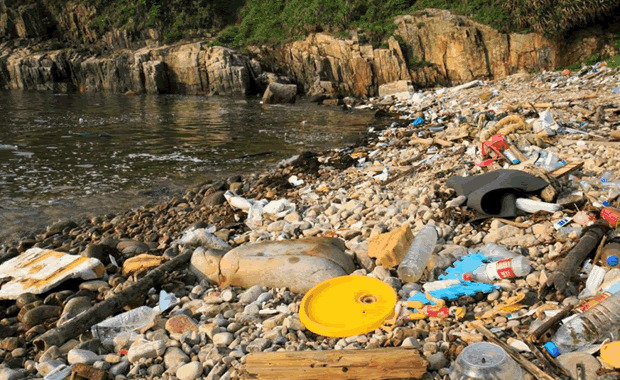 The main threats to the species have not been formerly identified. Potential threats include loss of habitat due to forest fires and competition with other grazing herbivores, such as horses. The rats are also preyed upon by dingoes. Some central rock rats are protected in the West MacDonnell National Park, and there is a captive breeding program in Alice Springs Desert Park. Copyright Notice: This article is licensed under the GNU Free Documentation License. It uses material from the Wikipedia article "Central rock rat". Glenn, C. R. 2006. "Earth's Endangered Creatures - Central Rock Rat Facts" (Online). Accessed 4/18/2019 at http://earthsendangered.com/profile.asp?sp=292&ID=4. Need more Central Rock Rat facts?